Health Being Institute is now on Meetup. In antiquity, from Greece to the Middle East, from India to China, there existed theories of health based on finding balance within the self and a respectful communion with Nature. Is 21st century medicine only concerned with curing disease by killing pathogens, removing tissue or tinkering with genes? Are ideas about the Self confined to psychiatry and religion? Have vital principles about health, which so interested our ancestors, been forgotten – overshadowed by the success of penicillin, the surgeon’s knife and gene therapy? Everyone experiences periods of sickness affecting their Self, their body and mind. If we can’t help ourselves to get better we turn to doctors for help. We trust them to tell us what is wrong with our health. Their interpretations vary and so do their treatments. Over the millennia we have witnessed the development of medical theories from the East to the West in an attempt to manage the human organism. 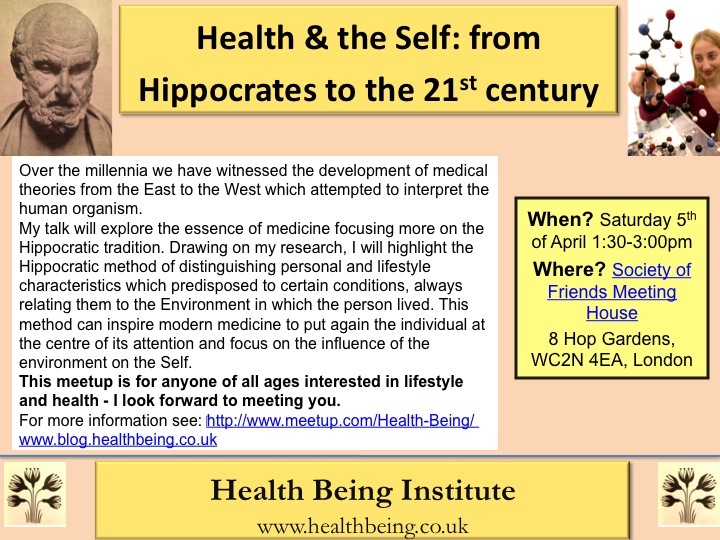 My talk will explore the essence of medicine focusing more on the Hippocratic tradition. Drawing on my research, I will highlight the Hippocratic method of distinguishing personal and lifestyle characteristics which predisposed to certain conditions, always relating them to the Environment in which the person lived. This method can inspire modern medicine to put again the individual at the centre of its attention and focus on the influence of the environment on the Self. This meetup is for anyone of all ages interested in lifestyle and health – I look forward to meeting you.